April 8. Baku. LezgiSport. 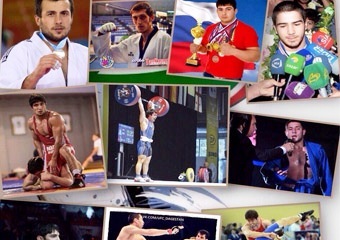 The Azerbaijan championship in grappling among boys aged 15 to 17 started in Baku on April 3 which was attended by our sportsman. In the weight category up to 63 kg Magommed Askerov won the gold medal and became the champion of the Azerbaijan Championship in grappling. It is noteworthy that in the final Askerov beat a titled opponent - World and European champion Shahin Logmanov. Our reporter talked to Magommed to find out how it was possible for a simple guy, who participated such a tournament for the first time, to win such a titled opponent. - Magommed, congratulations you on a brilliant victory. Tell me, please, what was the most difficult for you in the tournament? Thank you for your congratulations. The hardest part was to tune into the fight. Psychological mood to fight. - In the final battle you will have laid the champion of the World and Europe. How does it feel when a simple guy from the gym steps into the ring and beats the best in the world? To be honest, the opponent was much bigger than me and I thought that he would perform in the weight category up to 69 kg. In the final match they called me first, and when the rival came out, I first was all abroad, but then I summoned my strength and neatly performed the directions. - Just a day before the championship in grappling, on April 2 Baku hosted the national championship MMA, where our guys Marat Safarov, and Baba Mejidov won medals. Tell me, please, do you know them? Sure I train with Baba Mejidov in the same gym, and Marat is our mutual friend. I plan to defend the title and reach new heights in the sport.